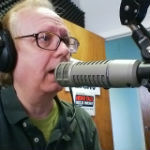 This past July, I had the pleasurable opportunity to sit in for radio host Coy Barefoot on WCHV-FM 107.5 in Charlottesville, while he was on vacation. More recently, Coy left the show to pursue other fascinating opportunities, making the host's chair vacant. WCHV program director Joe Thomas announced he was looking for a permanent host for the afternoon drive time show (it runs from 5 p.m. to 7 p.m. each Monday through Friday). I put my name in the hopper. Over on SoundCloud, Monticello Media is hosting an "American Idol"-like contest among the three contenders for the WCHV gig. The "votes" consist not only of direct emails to the program director, but numbers of plays, downloads, and "likes" on each of the three audition hours. I encourage you to visit WCHV Afternoon Auditions: Rick Sincere and say something supportive. In addition to those radio interviews, I have also posted audio of my recent interview with political scientist Larry Sabato about a new documentary from the UVa Center for Politics about the 1968 presidential election, called "Ball of Confusion" (after The Temptations' song of the same name). Remember to go to the auditions page to vote yes for Rick Sincere to host the still nameless afternoon talk show on WCHV-AM and FM.